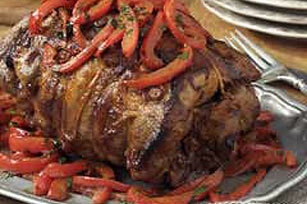 Revitalize your senses with our Patagonian Roasted Lamb Recipe. Our Patagonia Roasted Lamb Recipe is marinated for 12 hours to ensure a remarkable taste. Place dressing, 3 garlic cloves, 1 Tbsp. paprika and bay leaf in blender container; cover. Blend on high speed 2 min. Pour into large resealable plastic bag. Add lamb; seal bag. Turn bag over several times to evenly coat lamb with the dressing mixture. Refrigerate at least 12 hours. Preheat oven to 325°F. Remove lamb from marinade, reserving the marinade in small saucepan. Place lamb, fat-side up, on rack of roasting pan; set aside. Bring marinade to boil; cook 1 min. Remove from heat. Brush onto lamb. Bake lamb 2 hours or until done (160°F), brushing occasionally with the cooked marinade. Meanwhile, mince remaining 3 garlic cloves; set aside. Melt butter in medium skillet on medium heat. Add oil, garlic, remaining 1 Tbsp. paprika and pimientos; cook 2 min., stirring frequently. Stir in parsley. Place lamb on serving plate; drizzle with the butter mixture. Lamb shoulder has more fat than the leg, so it is generally cheaper and more flavorful. Serve with a baked potato and mixed green salad, tossed with your favorite KRAFT Dressing. Substitute 3 cups sliced red bell pepper for the fresh pimentos.